Cosplay costumes always amaze me. It's a noble art form and ingenuity is key to a great costume, but some go above and beyond. Most are based on comic book, anime or movie characters. Some cosplay costumes are made of plastic and some are made of steel. But the truly greatest ones are made out of cardboard. It's not easy to do and is sometimes more expensive than other materials. Cosplay is short for "Costume Play" and is when people wear costumes and accessories to represent their favorite characters. 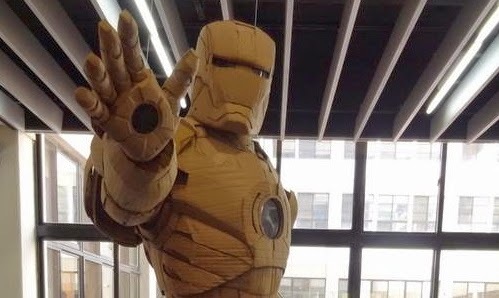 Here are the greatest cosplay costumes made out of humble cardboard. What do you think of the costumes? Are these the best cardboard cosplay costumes you've ever seen? Robocop was really impressive. With the square shapes, a lot of them look like Lego creatures. Wow! Impressive, I liked them all. When I was young My dad and me made a Cylon costume out of cardboard and foil. I wish I had a picture of it to compare. The Metroid one is epic. Also, there should be a Metroid movie. I'm with Alex. BIG Robocop fan. Very nice. The ironman one is absoluTely awesome and the robocop one, jut wow! Wow. They really are amazing. The details are lovely. Its amazing a 20yr old made this cardboard costume. The craftmanship really is quite detailed and imposing. These costumes are amazing. A lot of work must go into them. An 8-bit Metroid movie Tony although anything would be awesome. That sounds pretty good David! Your Dad sounds very cool. The Robocop one had props too Al. I couldn't find a photo to do it justice. Very amazing Spacerguy. That kind of talent is rare especially for someone at that age. A ton of work Medeia. But it's all worth it in the end. Cardboard. What a miracle you could do with them if you know what to do. You could even beat the expert cosplayers. Online purchase Cosplay Costumes, accessories, wigs, shoes and more. All Cosplay costumes are custom-made with your own measurements.